SEPHORA:Pretty Minis for Maximum Fun! If you're a SEPHORA fan (and, come on, who isn't? ), you must remember the Lashstash collection of mascara samplers that Sephora offered - twice!! Well, for summer, they are releasing several different sample-size kits, and they'll be available starting tomorrow (6/17). Get some pretty minis in a variety of categories, all for less than $40!!! I'll be putting the Sephora gift card I got for my birthday to good use with these favorites. 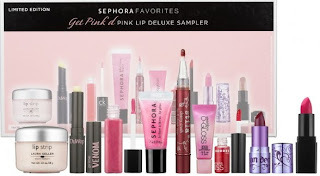 And it should come as no surprise, judging by the name of this blog, that I will be going for the Get Pinked Pink Lip Deluxe Sampler (shown below). Other kits include: Skincare & Makeup Sampler, Eye Deluxe Sampler, Fragrance Samplers for women and men, two different Mousturizer Deluxe Samplers, along with another Lashstash kit, and a waterproof mini-mascara kit called Splashstash! Which one (or five?!) are you going to get? Here's what comes in the Pink Lip Set!! Check out this great deal from QVC: you can order today, before it airs, their Today's Special Value for August 1st!! That's when BARE ESCENTUALS appears for 3 segments throughout the day. It's is a BARE ESCENTUALS 6-piece starter kit for under $33!! It's called the bareMinerals Makeup Revolution Starter Kit and it'll only set you back a mere $32.92 (plus, shipping & handling, of course, and tax, if applicable to your state - gotta get the fine print in). On May 1st, I wrote about the new DOVE Ultimately Visibly Smooth Wild Rose Anti-Perspiring/Deodorant (click here to read). Well, it's been almost 8 weeks since I started using it, and I'm happy to say that overall I'm really pleased with this new deodorant. It has made the hair softer and, surprisingly, I did notice that my underarms do look better and smoother. I've always had issues with that, because as someone who is pale but has dark hair, even when freshly shaven my underarms still didn't look quite hair-free (this was particularly angst-inspiring during my teenage years). But the other day I noticed my underarms looked really good and didn't have the pit-version of the five o'clock shadow going on. Yay! I'm Laura, and I'm a stay-at-home mom who loves makeup and wants to share my product passion with others who love makeup. I want this blog to be a fun, creative vehicle for me to "talk" about beauty essentials. I want to share with you, and I want you to share with me and other product junkies what you love and CAN'T LIVE WITHOUT! !